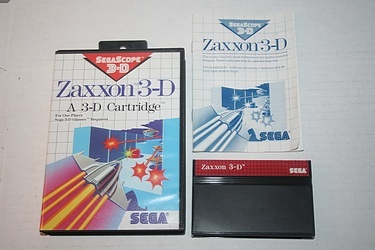 The name Zaxxon will always make a little shiver of recognition run through a classic gamer. Developed and released by Sega in 1982, the giant wood-grain countenance of this early shooter has earned more than the GDP of many small nations in this world. An arcade in the 80s, and one might say a classy home arcade these days, just isn't quite complete without a Zaxxon machine anchoring the corner. So it was in 1987 that Sega (by then, Tonka), in an effort to bolster their flagging SMS console, took this title and gave it the next logical upgrade, 3-D! "Wait, didn't James Cameron invent 3-D?" No. No he did not. Neither did Sega, but it really lends itself well to this game - sort of a match made in gaming/technology heaven. Using the add-on support card, and 3-D glasses, the home gamer could experience this classic title like never before! Just make sure you haven't eaten much before hand, and don't have illyngophobia or pogonophobia and you'll be fine.